That is $3.34 for a meal for 2, for a meal that's healthy, tasty and frugal! I cannot wait for dinner! If you are scared to make polenta and are lucky enough to have a Trader Joes grocery store near you, you can pick up ALL the items there. 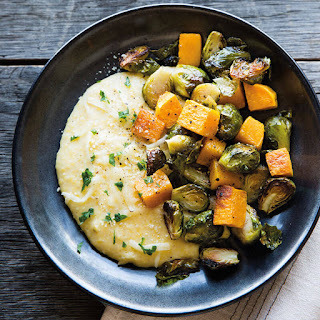 Their polenta is in the frozen section and is mixed with other veggies and you could add in the two types of cheese. This route would be simple and quick but cost a bit more for the ready made supplies. I know they have the squash already cut up and peeled, the brussels sprouts halved and cleaned and the frozen polenta ready to go with just a bit of microwaving. Try shaving money off your budget by eating on the "peasant" side a couple of nights a week and put the money you saved towards retirement, fun or debt!